What do your guests say about FLEXIPASS? How does FLEXIPASS Mobile Access work? GUESTS download the FLEXIPASS Mobile Access app from the app Store or Google Play Store and enter the FLEXIPASS CODE issued by the Hotel/Hostel/Serviced Apartment. That's it. FLEXIPASS is easy, intuitive and the secure mobile access solution. There's no need for time consuming and complicated registration procedures. USERS access the FLEXIPASS Web Portal and generate unique codes on the fly. Each FLEXIPASS code is assigned to a specific Hotel room number with a pre-determined check-out date and time. FLEXIPASS is the keyless entry access system for Hotels, Hostels and Serviced Apartments which is smart, quick and easy to implement. 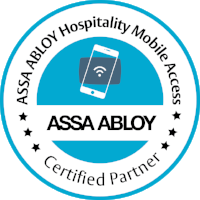 FLEXIPASS Mobile Access, partners with the industry's leading lock companies, allowing for off-the-shelf compatibility with the majority of access control solutions using Bluetooth Low Energy (BLE) technology.